It’s always a good idea to have a concealer with you in case you need a quick cover-up. Even better is one that brightens your complexion as it conceals! This Youth-Infusing Brightener and Concealer from Estée Lauder is a 2-in-1 product that includes a concealer at one end and a brightening serum at the other. Use the serum to plump, firm and perk up your complexion, and the concealer to even out your skin tone. This beauty must-have makes flawless skin easy, even when you’re stretched for time! Lip color tends to fade throughout the course of the day, so obviously a lipstick is critical to have on hand. 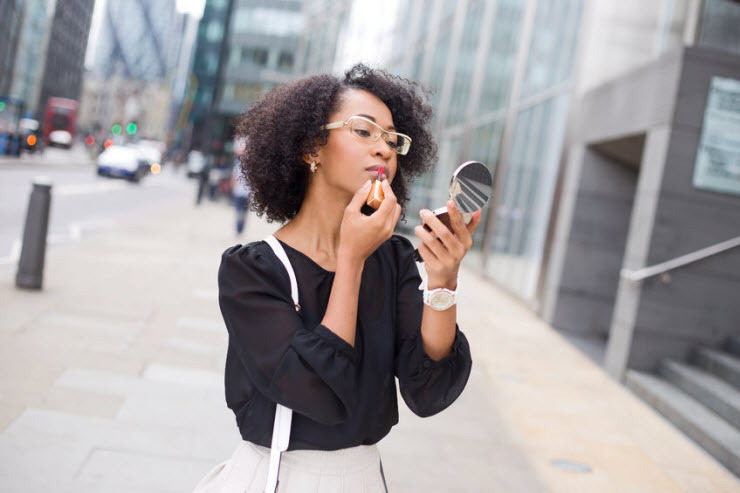 A good lip moisturizer is important too, as lipsticks can dehydrate your pucker. But who wants multiple lip products filling up an already packed purse? An all-day gloss like Stila Stay All Day gives you coverage and also contains moisturizing ingredients, so you get a gorgeous pout and still consolidate your clutter. Nothing invigorates like a splash of fresh fragrance. When your afternoon has you in a slump, give yourself a dab of perfume for a pleasant pick-me-up. Rollerball scents like Philosophy’s Celebrate Love set are convenient and compact, so you can freshen up without having to carry a full bottle in your purse and risk an expensive mess. During a long day, oil buildup is inevitable, so a powder compact can be a lifesaver as it absorbs excess oil and evens out any blotchiness. Products like Shiseido UV Protective Compact Foundation even have sunscreen in their powder to keep your skin safe from UV rays with an unbeatable matte finish. Keep one on hand for fun-in-the-sun that doesn’t compromise your makeup standards! You’re about to give a presentation in half an hour, and as you race into the restroom for one last makeup check, you discover a bright red pimple has made its appearance. When this nightmare becomes reality, there’s no need to panic. Peter Thomas Roth Acne Clear Invisible Dots Blemish Treatments are patches that provide a focused dose of salicylic acid to the offending blemish to reduce it quickly and effectively. They’re also practically invisible, so with a quick dab of powder, you can treat this disaster and then resume your day with confidence. When you’ve got evening engagements that require you to look fabulous coming straight from work, you need a dramatic eye to transform your look. But who wants to carry a plethora of eye products with them all day? With one pencil you can line and shadow your eye to give yourself a smoky, evening gaze that’s perfect for a night out. Dior’s Colour and Contour Eyeshadow and Liner Duo is a good example of this type of combo product, which gives you everything you need in one item so you can look amazing while you save time and money. Add some of these products to your makeup pouch, and you’ll be ready for anything your day may throw at you. You can correct small issues that arise, or even give yourself complete do-overs to revamp your look. And your purse will still have plenty of room for your other daily necessities!